Olympic National Park is a truly special wilderness preserve that includes a variety of unique ecosystems. The United Nations Educational, Scientific and Cultural Organization (UNESCO) has designated the park both a World Heritage Site and part of the international system of Biosphere Reserves. You can easily spend weeks exploring all that Olympic National Park has to offer. Those who only have a day typically spend their visit time at the Hurricane Ridge section of the park. Those who have a few days to devote to their Olympic adventure usually, after a stop at Hurricane Ridge and Port Angeles, proceed around the park in a counterclockwise loop. Along the way, you'll find ancient trees, mossy forests, picturesque lakes, expansive beaches, fairy waterfalls, and diverse wildlife. Beginning in Port Angeles and proceeding counterclockwise, here are the fun things to see and do during a visit to Olympic National Park in the state of Washington. Located on the south side of Port Angeles at the entrance to the park, this visitor center should be your first stop. You can find out about road and trail conditions in the park and get advice on the best hike and recreation opportunities for your interest and energy level. You'll also have a chance to view exhibits and a film that will orient you on the park's unique nature and history. The Wilderness Information Center, where you can obtain backcountry info and permits, is located inside this visitor center. The drive up to Hurricane Ridge via the Heart O' the Hills Road offers amazing scenery, including panoramic views of Puget Sound to Mt. Baker. You'll find the Hurricane Ridge Visitor Center at the end of the road; it offers exhibits, a film, and knowledgeable park rangers. The visitor center also houses restrooms, a snack bar, a gift shop, and places to sit back and view the snow-capped Olympic Mountain Range. Several trails can be accessed from the huge parking area, from paved nature trails to more challenging hikes. The mild Cirque Rim Trail will take you to a scenic overlook where, when the visibility is good, you can enjoy views of the San Juan Islands and across the Straits of Juan de Fuca to Vancouver Island. This forested river valley, located just southwest of Port Angeles, is a great playground for nature lovers. Hiking trails branch off from the shores of the Elwha River and Lake Mills, affording the opportunity to see waterfalls, Olympic Mountain range views, and old homestead sites. Camping and picnicking are both available in the Elwha Valley. Guided river rafting trips are available from Olympic Raft and Kayak (888-452-1443). The clean clear waters of Lake Crescent make it a wonderful destination for fishing, sailing, canoeing, or just sitting by the shore to take in the wonder of nature. A variety of accommodations are available at Lake Crescent, including the historic Lake Crescent Lodge, the Log Cabin Resort, and tent and RV campsites. Some services are available around Lake Crescent, including a restaurant, general store, boat rentals, and the Storm King Ranger Station. There are a number of hiking trails in the lake region, including the Spruce Railroad Trail, a nice flat trail that skirts the north side of the lake. The Sol Duc Hot Springs Resort is the center around which much of the Sol Duc Valley revolves. Nearby you'll find the Eagle Ranger Station and the Sol Duc Campground. The easy and gorgeous Sol Duc Falls hike is a must-do - the trailhead is located at the campground, with a network of longer and more challenging trails branching off the popular trail. The Ancient Groves interpretive nature trail is another Sol Duc Valley highlight. The Lake Ozette region of Olympic National Park is a destination, not a stop along the way. A good couple hours' drive off of the US Highway 101 (which is the main road around the bulk of the park), Lake Ozette is camping, paddling, and hiking paradise. While the services in this region are limited, the lake, ocean, and beach views are beyond beautiful and the memories will stay with you for a lifetime. Rialto Beach is the primary beach in the Mora Area of Olympic National Park, which surrounds the coastal town of La Push. Other nearby beaches include First Beach, Second Beach, and Third Beach. During a visit to this stretch of coastline you'll be able to do all the traditional Northwest beach activities, including beachcombing, exploring tide pools, and checking out sea stacks and arches. This expanse of old-growth temperate rain forest is a wonderland of green. The rich growth of trees, mosses, and ferns makes this one of the most popular areas in a park. Check out the Hoh Rain Forest Visitor Center, where you'll learn about nurselogs, a striking demonstration of the circle of life that you'll witness all around you as you head out into the forest. Be sure to spend time exploring the trail system around the visitor center, both the Hall of Mosses and the Spruce River Trail are easy and you'll enjoy the play of light through the old mossy giants and fresh green maples as well as pond, river, and stream views. The Hoh Rain Forest campground is located just south of the visitor center. One of the few concession-run lodgings located within park boundaries, Kalaloch Lodge offers both rooms and cozy cabins overlooking Kalaloch Beach and the Pacific Ocean. Both Kalaloch Beach and nearby Ruby Beach are extremely picturesque, scattered with driftwood, sea-tumbled rocks, and marine wildlife. 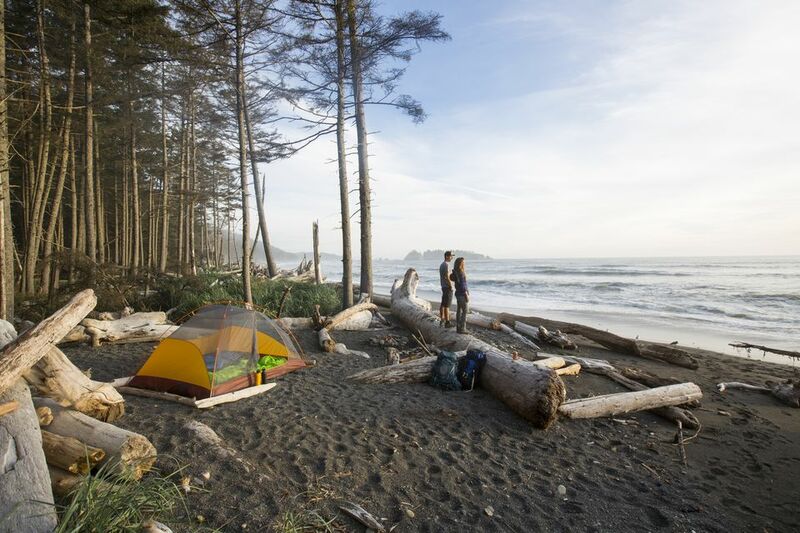 Camping is available at both the Kalaloch and South Beach campgrounds. In addition to strolling along miles of beach, there are several great trails overlooking the ocean and in the nearby old-growth forest. Lake Quinault lies on the southern border of Olympic National Forest; parklands occupy the north side, while Olympic National Forest lands circle the west and southwest sections. The lake itself is surrounded by a number of resorts and services. Most of the buildings are decades old, adding to the serene, step-back-in-time ambiance of the area. Many wonderful hiking trails crisscross the region, allowing you to experience ancient trees, charming waterfalls, rushing streams, fascinating bogscapes, and an old homestead site. Two small national park campgrounds can be found in this area, along with the Quinault Rain Forest Ranger Station and the Olympic National Forest and Park Information Center.